Our team of Life Skills Educators deliver a quality curriculum-based program built on pillars of Self-Awareness, Self-Management, and Self-Advocacy/Expression. Staff conduct ongoing evaluations and provide participants with progress reports each semester to reflect growth and celebrate achievements. 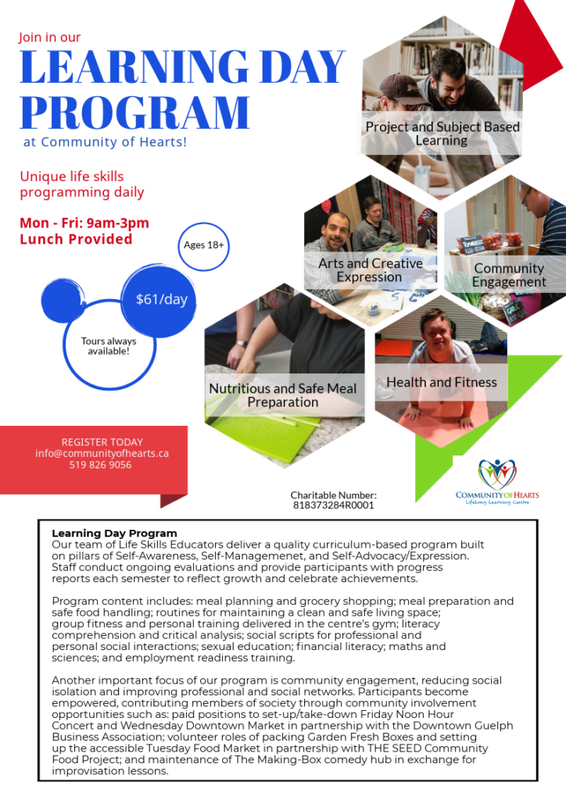 Program content includes: meal planning and grocery shopping; meal preparation and safe food handling; routines for maintaining a clean and safe living space; group fitness and personal training delivered in the centre’s gym; literacy comprehension and critical analysis; social scripts for professional and personal social interactions; sexual education; financial literacy; maths and sciences; and employment readiness training. Another important focus of our program is community engagement, reducing social isolation and improving professional and social networks. Participants become empowered, contributing members of society through community involvement opportunities such as: paid positions to set-up/take-down Friday Noon Hour Concert and Wednesday Downtown Market in partnership with the Downtown Guelph Business Association; volunteer roles of packing Garden Fresh Boxes and setting up the accessible Tuesday Food Market in partnership with THE SEED Community Food Project; and maintenance of The Making-Box comedy hub in exchange for improvisation lessons. Interested in joining us or finding out more about this program?